Lotus Evora 2+2 driven | What Car? We take the outrageous Lotus Evora for a test drive. With a chassis that blends supreme cornering poise with lavish straight-line comfort, you could be forgiven for thinking that all sorts of weird and wonderful electronic systems were underpinning the Lotus Evora. Not a bit of it. A simple, featherweight aluminium chassis attached to finely honed suspension, all overlaid with sinuous composite panels, prove that if you have the engineering expertise and no firm has more than Lotus it's possible to produce an outrageously enthralling, yet simple and cost-effective, supercar. As you let the 276bhp 3.5-litre Toyota-sourced V6 engine surge you forward, you become one with the Evora's near telepathic steering reactions, leaving you grinning like someone possessed. Despite the explosive performance, there's never any need to panic. With little body lean and so much information fed through to your finger tips, you can drive the Evora right up to its vast limits of grip. Should you be crazy enough to overstep the mark, hugely powerful brakes will slow your progress at an eye-bulging rate. Away from the twisty stuff, the Evora is a quiet and relaxed cruiser and that V6 engine is capable of highly impressive 32.5mpg on average. It's not all perfection, however. The rear seats are next to useless for adults, the pedals are too far off-set to the left, and rear visibility is extremely limited. So what! These flaws can be easily dismissed as merely the stuff of supercar compromise. What's more frustrating, though, is the fact that high-quality items such as the stainless steel buttons, superb figure-hugging sports seats and delicious sports steering wheel are undermined by low-rent fit and finish, and a rather kit-car-esque dashboard. Granted, our car was a pre-production model but, even so, the Evora can't begin to approach the cabin quality of a Porsche or Audi sports car. 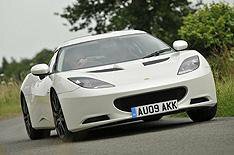 Still, you could be left wondering if Porsche and Audi will struggle to match the driving excellence of the Evora.